As much as I enjoy the assurance of having my iPhone in my pocket, I’m not much of a mobile user. I’m at my desk most hours of the day, and when I’m with friends, I avoid looking at my phone at all costs. I don’t like texting or writing e-mails on my phone. There are a few apps I value above all others. I have no doubt that they’ve made my life better. For example, I’d probably be lost in Montana right now were it not for Google Maps. And I activate Sleep Talk once a day in the hopes of catching myself say something funny while dreaming. But my most-used app–and probably my most useful app–is called Captio. Captio is super simple: It lets you e-mail yourself. At any time, anywhere, you have a thought or reminder that you absolutely can’t forget, you can just click on the Captio app and either talk or use speech-to-text to jot down a message. You don’t enter your e-mail address because the app already knows it. Later, when you’re ready to deal with that message, you’ll see it waiting in your inbox. I use Captio the most on long car rides, as it’s some of my best brainstorming time. But I really use it any time when I’m away from the computer. Sometimes I’ll literally be walking from my computer to the kitchen and I’ll open Captio rather than returning to the office. I love Captio and wanted to share it with you. I want to hear your most-used/useful app as well! This entry was posted on Thursday, January 19th, 2017 at 11:18 pm	and is filed under technology and tagged with technology. You can follow any responses to this entry through the RSS 2.0 feed. Thank you very much for the suggestion of the app Captio. Very cool. This will help me tremendously! 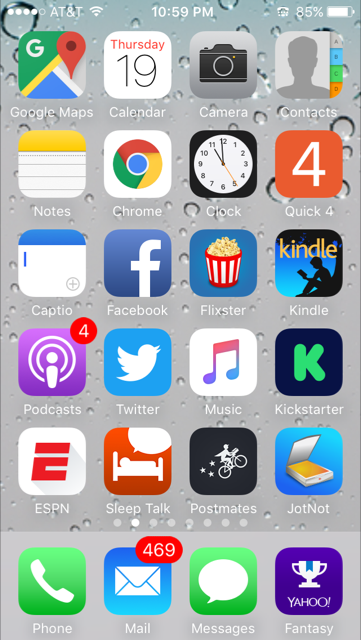 As far as my favorite useful app, I have a device/app integration to tell you about. I have an Amazon Echo. (Which I absolutely love & highly recommend) When I ask her to add an item to my shopping list or to do list, it shows up in my “todoist” app on my phone. That is my “go to” to do list that I use at the grocery store, when I’m out running errands, and I even use it to efficiently plan my day when I’m doing errands around the house. For example as I am in the process of cooking something I may realize I’m low on milk and can just say “Alexa, add milk to my shopping list” and it then shows up in my shopping list on my phone. Not to mention her playing music for me, telling me about the weather forecast, and telling me how many tablespoons are in a cup (as my hands are covered in flour and I don’t want to touch my phone). The wonders of modern technology! Steve: That sounds super helpful! I use a similar list app, but being able to just say it out loud at the spur of the moment would be incredibly useful. I have a Few that fall into different categories. I use a Pixel, and I’m pretty embedded in the Google ecosystem. But most of this is probably available for IOS too. -Google Keep: The unsung Hero of the Google App ecosystem. Checklists, shopping lists, notes, in a simple interface. My wife can make a shopping list and share it with me, it shows up when I open the app when I get to the store. -Google Voice Search/Google Assistant: I use this a lot to do what you use Captio for. “OK Google, Text Emily I’m on my way home.” sends my wife a text. Bonus – I can do most of the same stuff on my Google Home sitting in my kitchen. -Dormi: It’s a baby monitor that uses my old phone as the Baby’s room unit. I have my old phone set up on a mini tripod with the camera pointed at my son’s bed. I can open the Dormi app on my phone and it works as the parent end of the baby monitor. It auto-squelches based on the background noise, so it only notifies me if it gets noisier than the average in the room. -Chwazi: Best way to choose first player in a game, all players put a finger on the screen, and the app chooses one of the fingers. It can also divide the fingers into equal teams if you need to make teams for a game. My most used app is called Untappd. It’s a social beer app that let’s you rate beers, earn achievements and comment/like other friend’s check-ins. I really enjoy discovering new beers, and it has an algorithm that makes recommendations based on your check-ins and ratings. My most useful app is Slack. I work with a large team (50+ people) at TechRaptor, and Slack keeps us instantly up to date with each other. It’s especially helpful for those of us on our editorial team as we can ping each other at any time when we need help editing/making decisions etc. Yesterday I forgot to include an important image file in an email, and another member of our editorial team was able to ping me about it, and send me the file through Slack last night. I was able to grab the file instantly and send it off without needing access to the file’s original location. Travis: Untappd sounds awesome, especially the built-in algorithm. I’ve heard great things about Slack, and I appreciate your recommendation of it and how you use it. I like Pocket quite a bit – helps me keep up with reading on the web.